Ivanka Trump at the start of the second presidential debate in St. Louis, Oct. 9, 2016. She has it all — including the ear of her future president father and a husband, Jared Kushner, who will serve as a senior adviser in the Trump administration. But while Ms. Trump has found both professional and personal success by enjoying many of the benefits of feminism, she is far from an avatar of a feminist future. Instead, she’s a kind of post-feminist huckster, selling us traditional femininity and support of male power wrapped up in a feminist bow. The Trump-Kushners will arrive in Washington as one of the town’s most powerful power couples. While many think Ms. Trump will eventually take on a quasi first lady role — and while having either Ms. Trump or her husband working for Mr. Trump poses serious ethical and legal issues — it is important to note that Mr. Trump chose the male half of the Trump-Kushner pair to serve in the West Wing, presumably with the blessing of his daughter. The particulars of this arrangement are unusual, but the norms underlying it are not. Even in the cosmopolitan centers where "power couples" exist aplenty, the male partner is often the more powerful one, and finds his success precisely because of his wife’s combination of feminist-facilitated achievement and traditional feminine support. Unlike in past generations when educated women had a harder time finding partners, today, college-educated women like Ms. Trump are more likely than their working-class counterparts to wed, and also like Ms. Trump, usually delay childbirth until after the wedding. With the fewer financial stressors that come with dual incomes or a single extremely high one these educated couples divorce less often than those with fewer financial resources, despite other findings that both groups have comparable dedication to the marital ideal. That educated women fare better romantically and occupationally than they used to is in many ways a feminist victory, if only for women at the top of the heap. And Ms. Trump has used the carefully cultivated image of her own career and family to sell both her brand and her father’s political ambitions. Her Instagram feed is full of images with motivational captions about the importance of stay-at-home motherhood or maternal multitasking, often with the hashtag #WomenWhoWork. "I have a few very important roles, but being a mother will always be my favorite," she posted with a family photo. This mastery of balancing ambition with likability is no easy task. Women usually have to trade one for the other. Yet tabloids describe Ms. Trump as both a "doting mom" and a "successful businesswoman." Her father credits her with pushing him toward a paid maternity leave policy. She’s also a woman who sells this image strategically. The white working-class Americans to whom Ms. Trump’s father directed many of his appeals hew more closely to traditional views of marital obligations and gender norms than those who are college educated, even as most working-class mothers are employed outside the home and are more likely to be raising children on their own. Ms. Trump’s clear ambition remains unobjectionable in part because she seems to require nothing of men. She affirms her status as a wife and a mother first and a businesswoman second. While she speaks to the challenges of combining work and family, she makes no demands that her husband "lean in" at home — maybe Mr. Kushner does do the dishes, but they aren’t Instagramming it. Her push for paid parental leave is certainly laudable and especially out of the box for the Republican Party, but the policy she urged her father to propose wasn’t really about parents — it offered maternity leave only, emphasizing that the task of raising children remains the domain of women (even "women who work"). 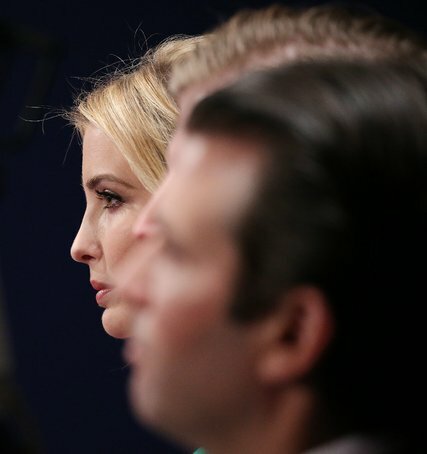 And her soft-focus feminism is put to use covering for her father’s boorishness: Mr. Trump has repeatedly boasted of his refusal to do any child care whatsoever for his five children, but his daughter nevertheless deems him "a feminist." For some people — perhaps people who voted for her father — there is a post-feminist salve in the neotraditional marriage model Ms. Trump promotes. It’s a palatable way to mesh old sexist ideas about women as nurturers and helpers with the realities of modern American life. Ms. Trump embodies a feminine ideal, even while she lives a more feminist reality. For working and middle-class women, though, the space where that ideal rubs up against reality is more likely to produce friction than anything else. Many Americans remain psychologically stuck between some vision of the 1950s white suburban family and the revolutionary, and still unfulfilled, promise of gender equality. While a majority of Americans agree that women should not return to traditional 1950s roles, that calculus changes when women have kids — a majority also believes that mothers should stay home with young children. This is an especially precarious set of expectations for families who, unlike the Trump-Kushners, live in constrained financial circumstances. For heterosexual couples of all income levels, having children often leads to discord precisely because mothers and fathers tend to slide into more traditional roles — leaving women to tend to the trivial details of adult life, like changing diapers, picking up the dry cleaning or, in Ms. Trump’s case, setting up a new house and getting the kids acclimated to a new school. Women expecting egalitarianism at home often feel hoodwinked by this new subtly sexist arrangement. Women expecting traditionalism find they’re stretched too thin by a belief that they should be the primary parent and an economic reality that demands their employment. Ms. Trump has written a book called "Women Who Work," so must presumably think she has advice to offer other women. But trying to emulate the Ivanka model without her financial means is a precarious path. Women who maintain demanding careers and also believe they are chiefly responsible for managing the domestic front are much more stressed out than women whose partners share in both work and family duties, according to social science research. For white working-class families, where women often work out of necessity and who also believe in the importance of divergent responsibilities for men and women, that dissonance sows significant marital conflict. Least feminist of all: The "women who work" discourse adopted by Ms. Trump frames this all as a woman’s choice, rather than the predictable and deliberate outcome when feminist gains are warped by conservative public policy.